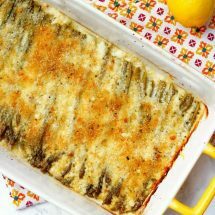 Easy Asparagus Gratin with Lemon is the perfect cheesy side dish! 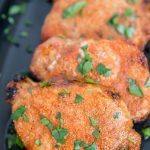 This dish is so versatile and can be served alongside a holiday dinner or whipped together quickly for a weeknight accompaniment to beef or chicken! 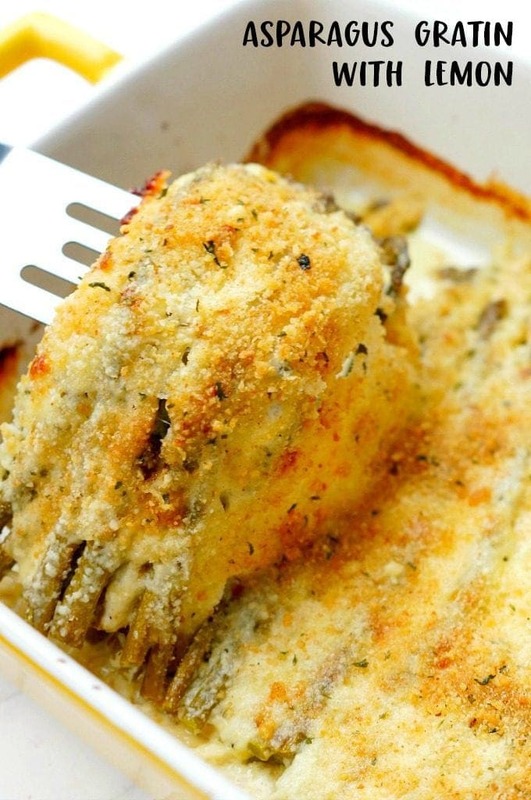 Your family will love the bright flavors of this gratin! 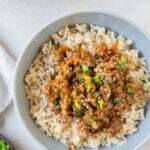 Amanda here from Old House to New Home, sharing one of my favorite “fancy” side dish recipes. 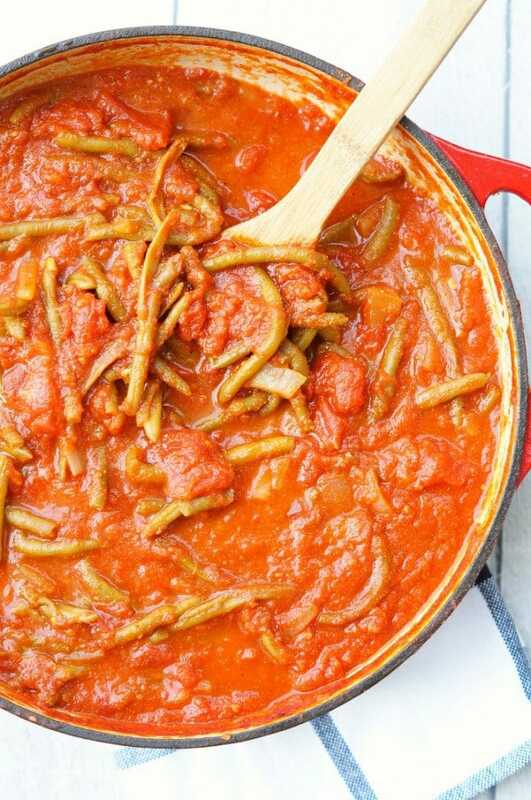 This dish looks impressive, but couldn’t be easier. 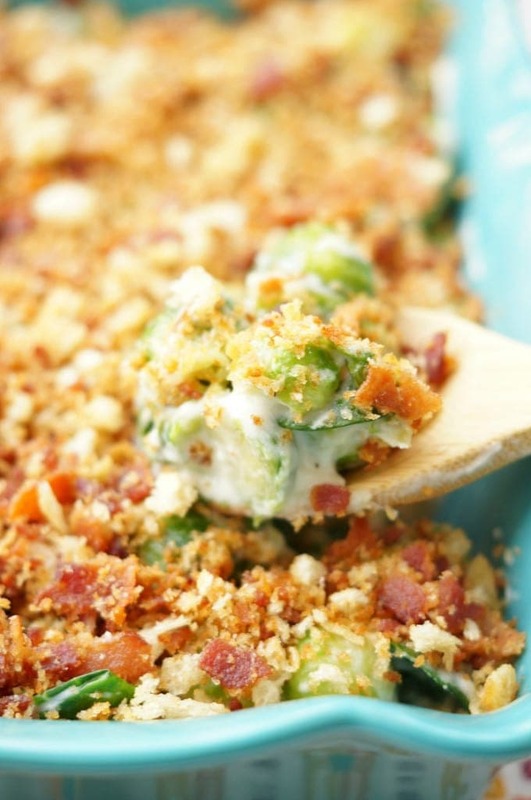 I serve this side dish almost every Easter dinner and everyone always gobbles it up! 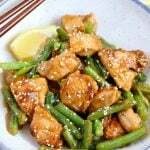 Lemon and asparagus are a natural flavor combination. Add swiss cheese to the mix and you have an amazing side dish recipe! Use thin asparagus. Since you aren’t steaming the asparagus beforehand, you want pencil-thin asparagus so it roasts in the oven. For any recipe when you are melting cheese, shred the cheese yourself. Pre-shredded cheese has wax on it to keep it from sticking in the bag and that interferes with the melting process! 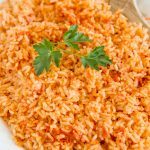 You will get a smoother sauce with freshly shredded cheese. 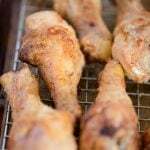 This is the perfect holiday recipe or anytime you are short on time because it can be assembled completely ahead of time and just baked when you are ready to serve. 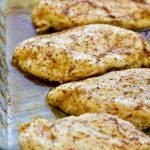 No rushing around at dinner time, just throw it in the oven and let it get all roasted and cheesy! Once this comes out of the oven, I garnish it with lemon zest right on top of the breadcrumbs. 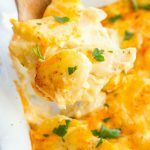 The fresh flavor brightens the entire dish and despite it being a cheesy casserole, it tastes light and fresh and perfect for springtime! Make sure to wait to add the lemon zest or you will “break” your cheese sauce from the acidity. 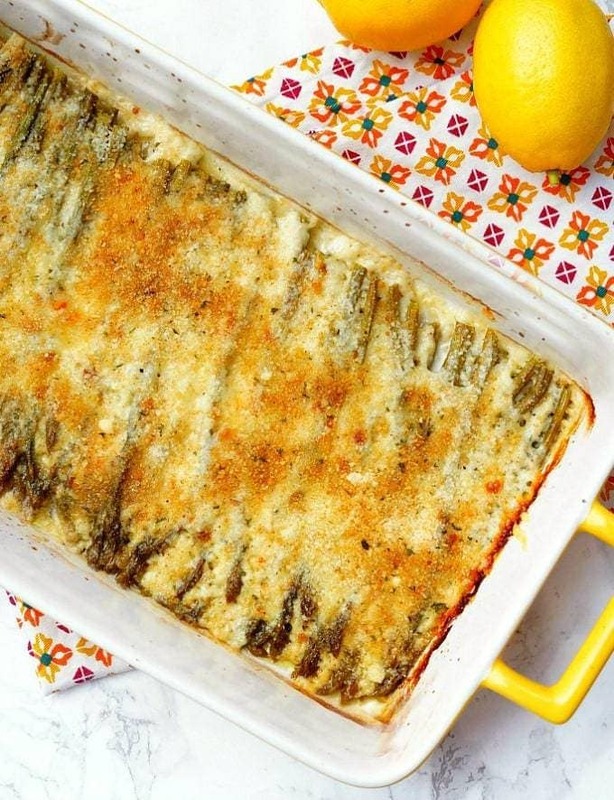 When you are craving comfort food, but also need some fresh veggies in your life, this Asparagus Gratin with Lemon will definitely satisfy your cravings! 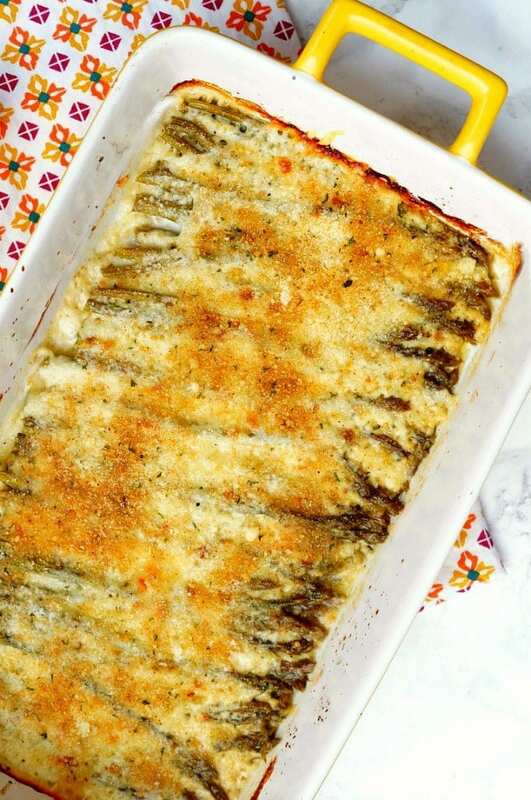 Easy Asparagus Gratin with Lemon is the perfect cheesy side dish! This dish is so versatile and your family will love the bright flavors of this gratin! Spread asparagus in a single layer in casserole dish. Spread olive oil over asparagus and sprinkle with a pinch of salt and pepper. In a small saucepan, melt butter over medium heat. Once melted, add flour and whisk until well combined. Let cook for 1 minute. Add milk and whisk well. Continue to cook and stir over medium heat until mixture is thickened, about 5-6 minutes. Add remaining salt, pepper, and garlic powder. Remove from heat and add half the swiss cheese. Whisk until melted. Pour mixture over the middle of the asparagus. 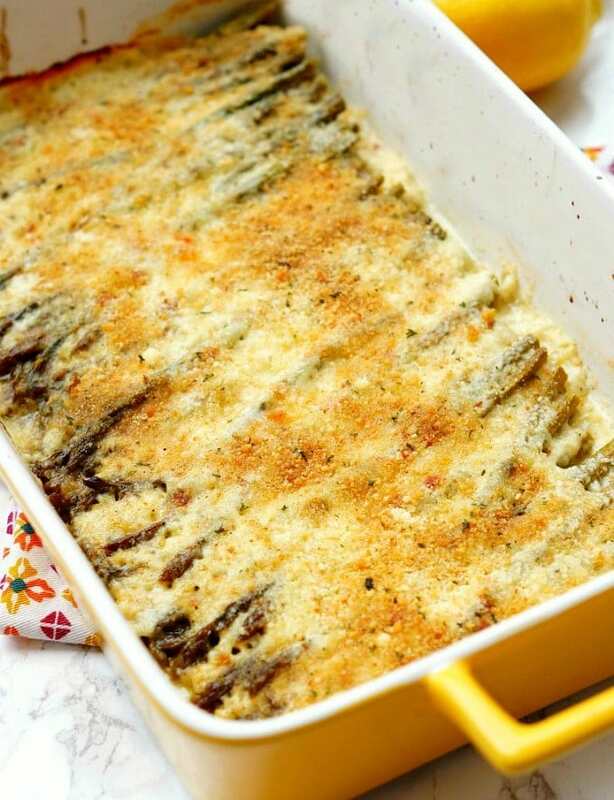 Sprinkle breadcrumbs, remaining swiss cheese, and parmesan cheese over the asparagus. Bake for 15-20 minutes or until cheese is bubbling and brown. Remove from oven and garnish with lemon zest. 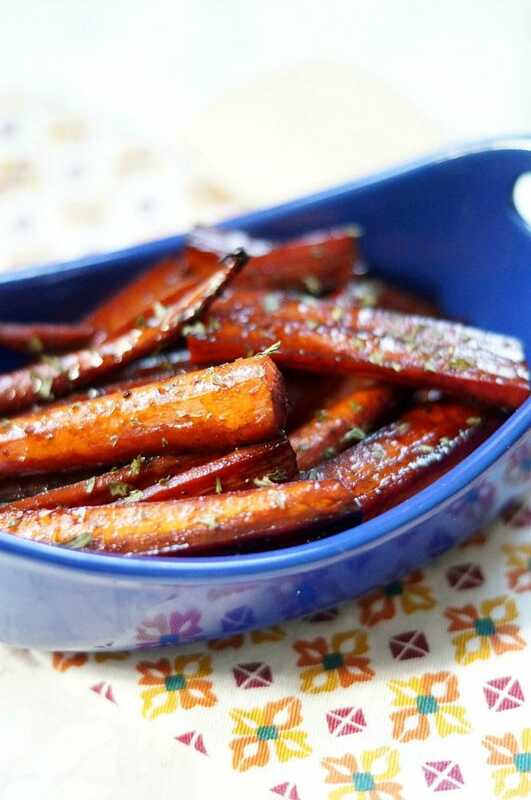 Try these other family favorite side dishes! 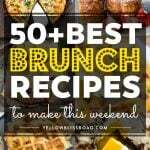 Try these other yummy asparagus recipes too!